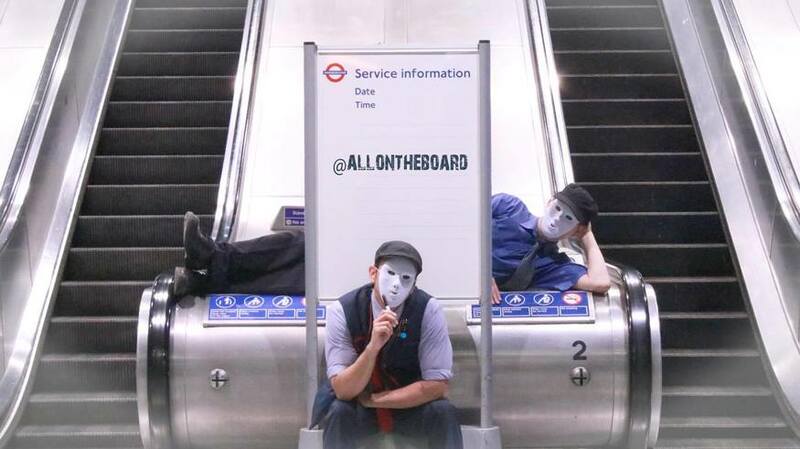 A mysterious duo have been creating some of the very best service information boards on the London Underground network. The pair do work somewhere on the network; not just anyone can roll up to a tube station and share their 'thought for the day'. We got chatting to them, although they won't reveal their identities in a bid to "keep up the mystery and fun. A bit like Banksy." It all began with Craig David, who was playing at The O2. The pair were messing around talking about their favourite Craig David songs, and then decided to wrap them up into a neat little poem on North Greenwich's information board. They noticed members of the public heading to the concert stopping to take photos and quickly realised they were onto something. (Side note: we're a bit disappointed at the lack of a Fill Me In reference on the poster, but we'll let it slide this once). From there they moved onto more events, mainly concerts that take place at The O2 arena. But they do venture beyond North Greenwich. 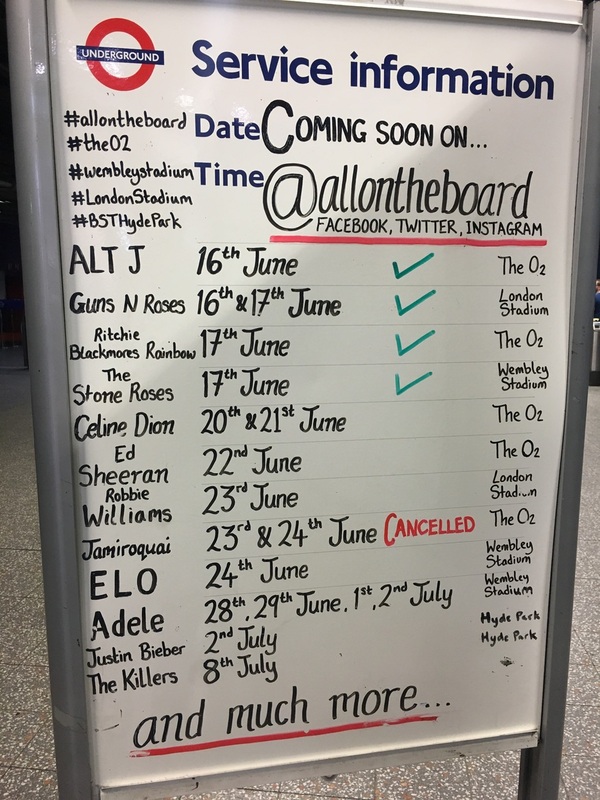 Their board for Jeff Lynne's ELO took pride of place in Wembley Park station. The public response is at the heart of what they do. They're just trying to raise a smile with customers: "And it has gone well beyond what we could have imagined." "People are disappointed if there isn't a board or poem at the event they turn up to." 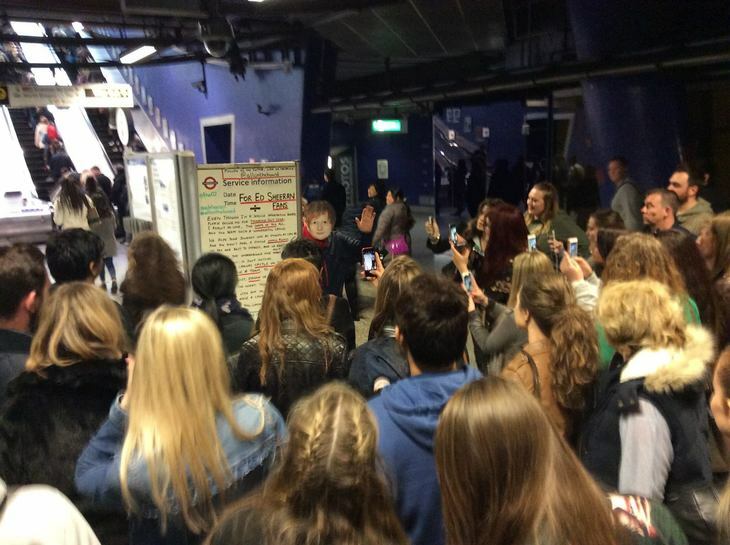 You might have already seen their Ed Sheeran board which went viral. They also often get the local tube staff in on the fun, by having them wear masks of the performer who's playing. Here's a grumpy Robbie Williams. It's not just concerts they cover. They've tackled all sorts of events from wrestling to Star Wars day on their boards. They also had poignant responses to the recent terror attacks in Manchester and London Bridge and the Grenfell Tower fire. Their efforts have been noted by many of the performers for whom they created boards. Take a look at some of their other fantastic boards below. A glimpse into the future of All On The Board. To keep up to date with their latest creations, make sure to follow All On The Board on Facebook, Instagram and Twitter.